A compound isolated from the frog, which grows to 27cm as a tadpole before shrinking to 4cm in adulthood, stimulates insulin release. A synthetic version of the compound - pseudin-2 - could be used to produce new drugs, delegates at the Diabetes UK annual conference heard. Around two million people in the UK have type 2 diabetes. The condition, which is often associated with being overweight, develops because the body does not produce enough insulin, or when the insulin that is produced does not work properly. It means people cannot regulate their blood glucose levels properly. Scientists from the University of Ulster and United Arab Emirates University have tested a synthetic version of pseudin-2, a compound which protects the paradoxical frog from infection. They found it stimulated the secretion of insulin in pancreatic cells in the laboratory. And importantly, there were no toxic effects on the cells. The synthetic version was better at stimulating insulin than the natural compound, opening the way for it potential development as a drug for treating diabetes. 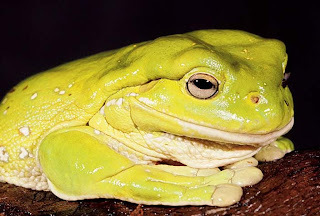 Study leader Dr Yasser Abdel-Wahab, senior lecturer in biomedical sciences at the University of Ulster, said there had been a lot of research into bioactive molecules from amphibian skin secretions. One recently developed diabetes drug - exenatide - was developed from a hormone in the saliva of the Gila monster - a lizard found in south-western United States and northern Mexico. "We found that it stimulated the secretion of insulin and that the synthetic version is more potent that pseudin-2 itself. More research is needed, but there is a growing body of work around natural anti-diabetic drug discovery that, as you can see, is already yielding fascinating results." Douglas Smallwood, chief executive of Diabetes UK, said although type 2 diabetes could be managed with diet and physical activity, the condition was progressive and may require medication to control it effectively.